If the ILC comes to Iwate prefecture, one of the major challenges will be to inform the local community about their big new science neighbour. The prefectural government and the councils of the host town have already set up up ILC task forces, and an expat grassroots support committee actively promotes the project in the area. One of the host towns, Oshu, has now conducted a survey with children in high school to find out what they do and don’t know about the ILC, what they hope and what they fear it will bring. The Association questioned a total of 1408 children between the ages of 15 and 17 from the first and seconds grades of seven different local high schools. Out of these, 30 percent said they knew a thing or two about the ILC, 68 percent didn’t, and 2 percent provided no answer. Thirty-four percent of students have already attended a lecture, symposium or event about the ILC, some are veterans with several attended events, but 68 percent had never come in contact with ILC-related information. The survey also asked about their expectations and their fears. The large majority seems neutral towards the project: 71 percent say they do not have any expectations for the ILC, while 28 percent do (1 percent aren’t sure). Similarly, 83 percent say they have no concerns about the ILC, 16 percent do (and 1 percent aren’t sure). The survey gets really interesting where kids express their hopes and fears. Especially the fears will sound familiar to any researcher who has ever done outreach work, and they need to be taken seriously and addressed well. Many of the children worry about radiation, accidents, pollution, terrorism, black holes and explosions. “Will the same problem happen like in the Fukushima nuclear plant?”, asks one student, another wants to know whether the ground foundations are okay and fears that “mountains will disappear and there will be effect on nature and wildlife.” The students also worry about their local culture: “I am worried about incidents because foreigners will be coming and going,” says one, “the countryside will disappear,” says another, and “too much international culture will cause Japanese culture to disappear,” says another. They wonder how long construction will take, whether wages and land will be enough, and even what will happen after the ILC. In order to improve knowledge about the ILC, the children suggest “explanation meetings”, more information in the news and in newspapers, talks in school and generally more detailed information. “More people should know about it,” says one student, another states “I don’t know what the ILC can do so I want more detailed information.” “If I can know more about the ILC, then I can become interested in it,” says a third. Some kids even used the survey’s comments section to wish the project good luck: “I am cheering for you and looking forward to it,” they say. “The most interesting outcome for the association is that about a half of students are not interested in the ILC and so many students don’t know about the ILC project,” says Sato. They are making the results of the survey available to related organisations so that they can plan actions to provide information about the ILC project to local people. “We hope this survey contributes to making a multicultural society,” he stresses. Getting the trust and support of the local community is key to the successful integration of a large science facility into its surroundings. When the ILC gets built, it will continue the tradition started by other major laboratories like Fermilab, CERN, KEK or DESY to invite the neighbours to the lab, explain the goals of the project and show them the construction sites and the hardware. Researchers will also reach out to the local community by taking the lab to the people to alleviate fears and build trust. 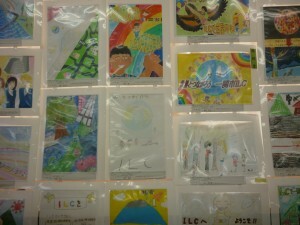 The ILC sets itself off from the other projects by already having the active support of local governments and communities through the various Science and ILC Promotion Divisions (Iwate), ILC Promotion Division (Ichinoseki), International Relations Association and ILC Division (Oshu) and the ILC Support Committee. “I am sure we can convince those people who don’t know or aren’t sure about the ILC to support the project if the future lab and the communities work together,” says LCC Director Lyn Evans. I am surprised that so many students do not know about the ILC at all. I can expect some of them will not be interested in the ILC for now because scientific fields are not very popular in students and pupils in Japan these days. But I can not expect they do not even know about the ILC, despite local people have been making efforts to spread its information. Although I am not a communicator nor an insider, now I know there is a lot of works to spread the right information especially among young people in this country.